Osteochondritis dissecans (OCD) is a condition that develops in joints, most often in children and adolescents. It occurs when a small segment of bone begins to separate from its surrounding region due to a lack of blood supply. 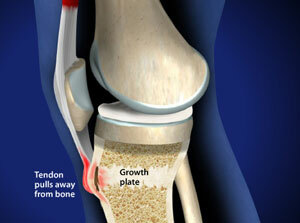 As a result, the small piece of bone and the cartilage covering it begin to crack and loosen. The most common joints affected by osteochondritis dissecans are the knee, ankle and elbow, although it can also occur in other joints. The condition typically affects just one joint, however, some children can develop OCD in several joints. In many cases of OCD in children, the affected bone and cartilage heal on their own, especially if a child is still growing. In grown children and young adults, OCD can have more severe effects. The OCD lesions have a greater chance of separating from the surrounding bone and cartilage, and can even detach and float around inside the joint. In these cases, surgery may be necessary. Osteochondritis Dissecans of the Knee is a condition which occurs when a portion of bone or its overlying articular cartilage is cut off from the blood supply, creating a “dead” area of bone and cartilage. Osteochondritis dissecans of the knee usually affects the condyle of the femur, and may occur after injury or trauma to the knee, or from repeated stress of competitive sports. This condition usually resolves spontaneously in most juvenile cases, in about 50% of adolescents, and rarely in adults. What is treatment options for OCD lesions? In most cases, OCD lesions in children and young teens will heal on their own, especially when the body still has a great deal of growing to do. Resting and avoiding vigorous sports until symptoms resolve will often relieve pain and swelling. If symptoms do not subside after a reasonable amount of time, your doctor may recommend the use of crutches, or splinting or casting the affected arm, leg or other joint for a short period of time. In general, crutches are required for about 6 weeks after surgical treatment, followed by a 2- to 4-month course of physical therapy to regain strength and motion in the affected joint. A gradual return to sports may be possible after about 4 to 5 months.